A big myth in fitness is that you need fancy and or expensive equipment to get in a good workout. One of the goals of the Coach Rollie Method and with the free workouts you need is a slam ball or equivalent and some suspension straps, or equivalent. . Check out the free fat burning workout video. Below the video, I’ll go into some of the details. The Breaking Fit Workout utilized 4 exercises. These exercises are to be done in circuit form. 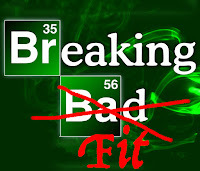 The exercises in the Breaking Fit Workout are, Deck Squat, Ball Slam, Push Up, and the Row Thrust. This is a full body workout with the reps kept low exercise to exercise to maximize power production. Overall work volume is accomplished by doing 20 rounds, that’s 100 reps total of each exercise.